Do you notice a nice AGLOCO's logo in your left handside? I got this from my friends and what I want to tell you is there are some more logos that you all can use in promoting AGLOCO. What I'm going to write today is about the potential of AGLOCO. As many of you know, companies like google are making billions of dollars for paid advertising. AGLOCO will give you part of that money for everyday surfing you would normally do, as well as, for the members you refer and the members they refer. Instead of just paying you plain cash, you will be given the opportunity to receive your payments in stocks of the company. I'm sure many of us wished they invested in google at the beginning so they could have made that 500% return. Well AGLOCO will give you that chance for FREE. You will get the chance to make a huge investment with no loss. You have nothing to lose. 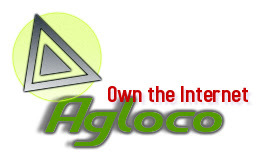 If AGLOCO becomes successful, you will become rich. If they are not sucessful, you still will make some money from the stock that you own. AGLOCO is a win-win situation, so don't miss out.